Tinleif is a Bosmer on the short side even by the male standards, which has caused some other races to think that he may be a child. His build is lean and athletic with tattoos on both arms. Tin does have a younger looking face with a thin nose and a scar over one eye. He has shoulder length black hair that he keeps down most of the time but will put up on some occasions. Tin also has antlers at some points in his life that will sometimes shed and grow back. Tin is polite and reserved. He tends to have a fearful respect for powerful individuals. He is also honest to a fault. MOTIVATIONS / PURPOSE Survival and Learning to be a Spinner. PHILOSOPHY Nature has its balance. All we can do is survive it. Tin’s main abilities come mostly those he learned through surviving and the necessity of learning them. He is a master at archery and less so at dual wielding. He is able to summon a Bear that he calls Whispers to aid in battle along with other companions but for shorter periods of time. He is also able to craft basic items and furniture out of bone and hide. Tinleif is currently learning how to craft things out of other materials as they have become move available from traveling outside of Valenwood. He is also starting to learn more magic as the need has arisen. Tin is hoping to learn more about Spinners and how he can start to take on the role of one along with learning their abilities. Tin has 2 items that he keeps with him at all time a small doll of the green lady which was the only toy he got to keep at the Elden Root orphanage and a bird skull necklace that he got from the Spinner in his past. (It looks like the one that is from the Deepwoods pod-singer costume). Tin uses a bow made out of pieces of bone from creatures or people he has killed that have a significant effect on his life thereby adding to it whenever a major event happens. He sees it as his way of honoring the pact as he may be unable to use the whole bodies of those he kills. He uses the hide and other body materials for the string. He also uses daggers and swords made in a similar fashion through the blade itself might be made out of metal he will still use bone if he can. He finds that he uses most bones that he collects to make arrows. 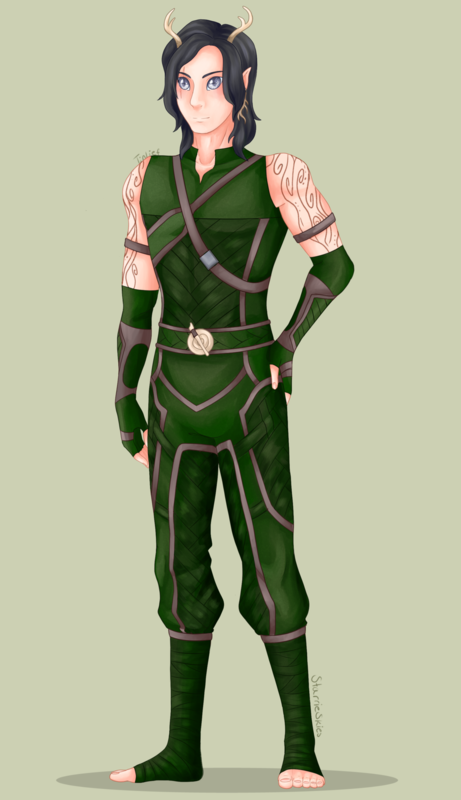 Tin has 2 sets of armor that he uses one that he finds tends to blend in better when traveling around the world that keeps him warmer and another that is typical wood elf armor. He prefers his wood elf armor over the other. Tin’s first memories are that of an orphanage in Elden Root. He lived most of his childhood there and learned the basics of crafting and archery. 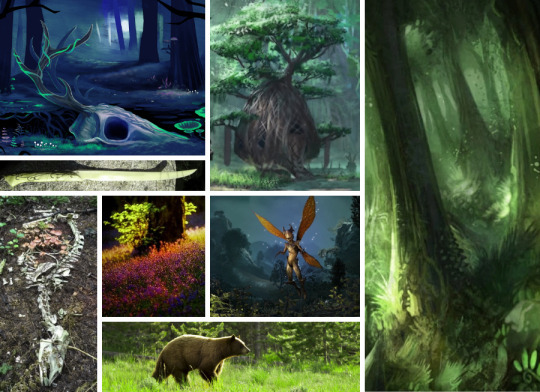 When he was around 11, he decided he wanted to get away from civilization and wander the Valenwood forests. He struggled greatly at first and had many near-death encounters from harmful wildlife to starvation from lack of food. At the times he was closest to death it seemed as if the forest and its spirits pitied him and would send him help in the simple form of a plump rabbit or a passing kind traveler. Although he never created a bond with another person, he did learn to value others and the need of them to help in his own survival. As time continued on Tin began to notice the spirits of the Green more. He was curious about them and would ask other Bosmer he ran across about the spirts, he would get vague answers about the Green and Y’ffre, but he wanted something more solid. Eventually, Tin came across a traveling Spinner that explained more about the spirits and about the abilities of spinners themselves. He thought that by learning some of the abilities of the spinners he would learn to find ways to create a connection with the spirits. So, he traveled with the Spinner for a while, to learn how to weave stories. Tin does not remember the name or face of the Spinner or much of the time he has traveled with the Bosmeri storyteller, but he recalls all of the skills he learned. Tin learned how to weave tales of the past and bringing things to the now but he has not been taught abilities with altering memories or telling the future. After his time with the spinner Tin learned how to weave stories with the spirits making them a part of the real tangible world. He created a strong connection with one he calls Whispers that takes the form of a bear he uses as a combat companion. He calls it Whispers as he always seems to hear distant whispers from the spirit when he spins his stories. He finds the whispers comforting. As Tinleif continued to grow he decided to come back to society and travel into bigger cities for supplies and coin. He started to take up bounties to earn some money as he found his knowledge of the forests and his skills came in handy for. Tin still spent a majority of his time in the forests, but he did see advantages to interacting with civilizations again. Through his trips into the city, he started to become interested in learning how to craft properly so that he could have better weapons and protection while he traveled and also make coin off of crafting. Tin finally decided to travel beyond the forests of Valenwood and explore the rest of Tamriel he can be seen in the Skyrim, Highrock, and Summerset Isle regions. He still does spend a lot of his time in Valenwood as that is his home and where he is most comfortable. If you are a person that wants a to hire a guide or a mercenary for protection in Valenwood you could most likely make contact with him in Elden Root or other major cities in Valenwood. Tin is also currently looking into the Spinner that he ran across in the past he has no memory of the spinner beyond his knowing that he traveled with them and learned some of the basics of spinning in the past to help him communicate with the spirits. Or any other Spinner that may be willing to have an apprentice. He will talk to almost anyone that approaches him first even if he may seem a little reserved after he opens up he wears his heart on his sleeve.